Almost exactly two weeks after the chairman of the Sarasota County Commission directed county staff to get answers to questions raised by a county-funded peer review of the City of Sarasota/U.S. 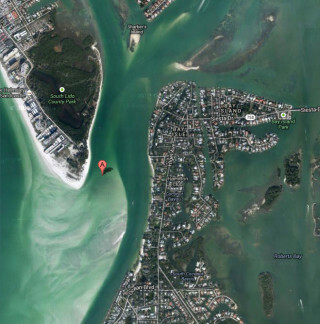 Army Corps of Engineers proposal to dredge Big Sarasota Pass to renourish Lido Key Beach, no meetings have been scheduled yet between city and county staff, The Sarasota News Leader learned this week. During an April 5 telephone interview, Laird Wreford, the county’s coastal initiatives manager, told the News Leader he has spoken informally with City of Sarasota Engineer Alexandrea DavisShaw, who has been “very amenable” to working with county staff on making sure the questions are answered. One factor in planning the meetings, he added, is determining who the participants should be. Nonetheless, he said, he anticipates a discussion with city staff within the next few weeks. The county paid $49,620 for a team with the Atkins firm to undertake a review of the $19-million renourishment project proposal; the report was delivered in October 2015. The contract included a contingency line, Wreford said, that would allow for further “nominal tasks.” He added, “There is a small amount of money left in this contract we could tap” without having to hire another consultant. If the county were to seek more outside expertise, he noted, that would necessitate spending more money. 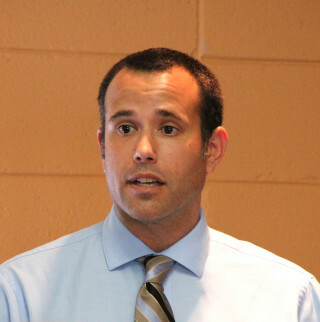 County staff has sent questions to the Atkins team and is awaiting its responses, which will guide the discussions with city staff, county spokesman Jason Bartolone explained to the News Leader on April 12. Wreford also told the News Leader that it is possible the county could attempt to seek more technical expertise in securing the information to fill in the gaps cited by the peer review. Regarding the contract contingency, Wreford said he considered that a prospect if, for example, county staff wanted to have the Atkins team take a look at specific information the city or the U.S. Army Corps of Engineers (USACE) could provide as part of filling in the information gaps. “I look at that Atkins report as being very valuable,” he said, in terms of pointing out those the gaps, which Atkins Senior Project Manager Charles Mopps discussed in a March 23 presentation to the County Commission. During the March 23 County Commission discussion of the Atkins report, Commissioner Carolyn Mason told Wreford she also wanted to make certain that questions raised by “a group of citizens” are answered. 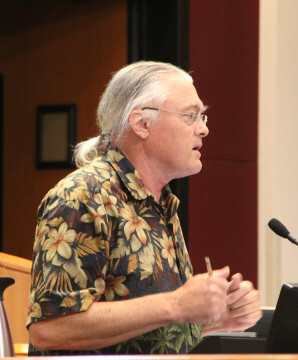 On April 5, as part of the monthly meeting of the Siesta Key Village Association (SKVA), the chair of the board of the nonprofit group Save Our Siesta Sand 2 (SOSS2), reported that the day before the Atkins peer review discussion, Jono Miller, an SOSS2 advisory board member, submitted a list of questions to the County Commission. Miller is the retired director of the Environmental Studies Program at New College of Florida in Sarasota. Coastal scientists have made it clear, he continued, that the dredging plan put forth by the USACE and the city could lead to serious problems. Among those experts is Robert S. Young, professor of coastal geology at Western Carolina University in North Carolina, who is also director of the Program for the Study of Developed Shorelines, a joint Duke University/Western Carolina University venture. In May 2015, SOSS2 hosted a presentation on Siesta Key by Young about the proposed Lido project. 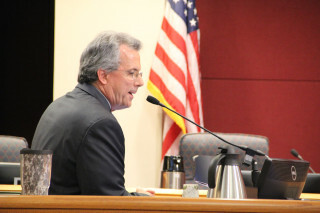 Miller told the County Commission March 22 that Mote Marine Laboratory in Sarasota also has offered the USACE data that could be helpful in its studies of potential effects of its plans, but the USACE has not asked for the material. 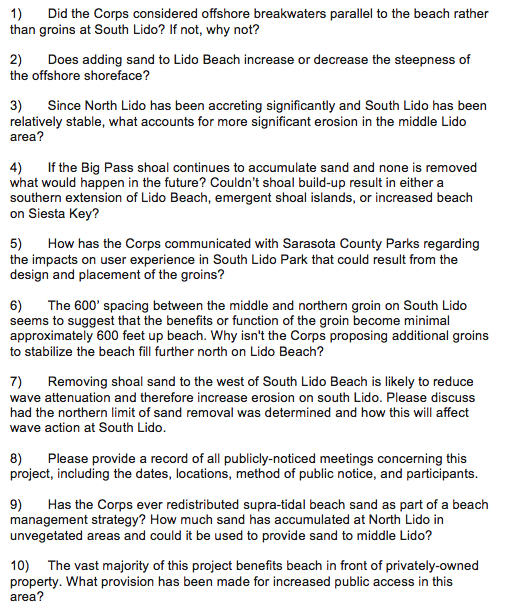 SOSS2 is one of several Siesta Key organizations opposed to the plans for dredging an initial 775,000 cubic yards of sand from the Big Pass ebb shoal for the first phase of the Lido renourishment project and for subsequent sand removal from the shoal over the 50-year life of the plan, as outlined by DavisShaw and the USACE project manager. Regarding the “smaller set of questions,” Osterhoudt was referencing a list SOSS2 sent to the county in January. Questions 21-39 are not new, either, van Roekens pointed out, as members of SOSS2 have discussed them with the county commissioners and sent them to city and county staff members. Among the new questions are those asking why the USACE has not been willing to discuss a smaller project similar to previous Lido renourishments; why the USACE chose to eliminate one of three groins from the proposal to hold sand in place on Lido between renourishments; and who is liable — and “do they have sufficient resources” — if damage results from the project. Editor’s note: This story was updated with new information on April 12.